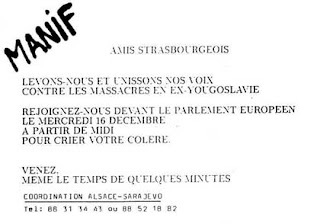 I (that is the author of this Blog, Yves Messer) was living then in Strasbourg (Alsace, North-East of France), a city famous for its wine and among other things for hosting the European parliament. ... and finally some 300 showed up!! The operation was a success! 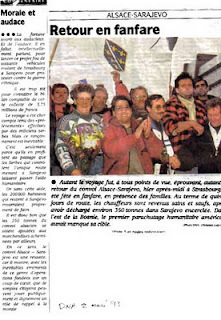 The day after, we held a meeting to officially create the "Alsace-Sarajevo" association in a room packed with hundreds of people! 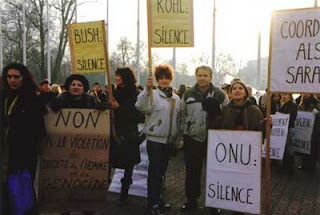 People of good will, from all walks of life, touched and horrified by what was happening there and angry against their own government (Mitterrand's France was de facto siding with Miloševic's Serbs). They would become the core of the whole operation. Normal citizen would show to the world they do care. They will become one-time heroes of an unprecedented humanitarian operation. A key person joined us; Ms Anne Schumann who, thanks to her organizing abilities and political connections, helped the operatrion to gear up. Thanks to her, we received the support from a major local political and historical figure and respected from all: Mr Pierre Pflimlin. This was essential for the next stage of the operation: the fundraising. The practical decision was that we preferred to collect money rather than goods. Why? Because we know from experience that one could be appalled by what people would literally "get rid of" for "charity." We didn't want that. The other reason was time. It would have required far too much time to pack objects of various sizes, sort them out etc... And we were in an emergency situation. The option was to create one standardized "aid-pack" parcel whose size would optimize the space in the trucks, and also guarantee the quality and necessity of their contents: i.e. nonperishable food, products of hygiene (like soap, toilet paper or make-up set for women...), etc... that is for people living in exceptionally rough conditions. So, one month later, on January 17, the "City Councils Open Day" operation was launched and announced by all local medias, an operation by which local authorities would help us with their staff to collect people's donations. 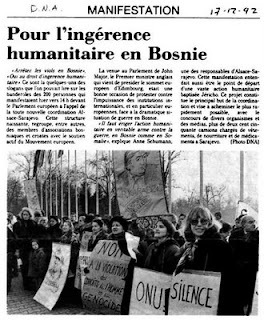 People were moved to know they could help doing something about what was happening in Sarajevo, however small their contribution was... I remember seeing on TV an old lady, who remembered the Second World War's atrocities, putting some of her small savings in the box, with tears in her eyes and saying to the camera: "Thank you...!" In total some €880,000 (about US$1 million then) were raised. 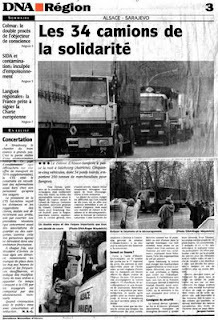 The night before, we had a contact with three trucks from Toulouse (South of France), which were like our "scouts". Good news! 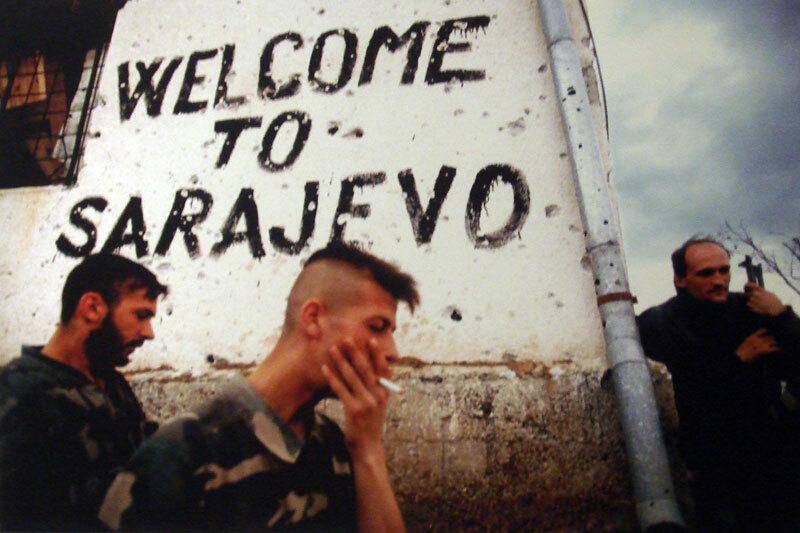 ; they managed to enter to Sarajevo. After Salzburg (Austria), the convoy had to load additional goods at Ljubljana (Slovenia) then to spend the next night to Rijeka, a Croatian port on the Adriatic. Then off to Split, Kiseljak (Bosnia), a station occupied by the UN blue helmets where they would await for the necessary green light to enter to Sarajevo. Which they did after one week of travel through very hard wheather conditions on February, 24... The drivers were exhausted and sometimes close to mutiny... All of that disappeared at the gates of Sarajevo, the ultimate destination! Now the delivery operation! All of the parcels were stored in 8 different safe places and distributed by local district associations and hospitals. The majority of the drivers were invited in host families, feeling what it is living in cold winter with no running water, no electricity, no heating... The following day we all had to go back to our usual comfort, leaving behind so many emotions from thankful people who realised they weren't completely forgotten... Was that the reason why security was temporarily forgotten? 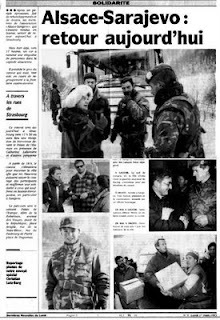 To the exit of Sarajevo, the convoy left without any Bosnian guide and was found itself in ... Dobrinja, the most bombarded and exposed district of Sarajevo! How is that that in two months time a tiny, unknown, inexperienced association of a handful of dedicated persons have made the dream of an aid convoy to Sarajevo in wartime come true? 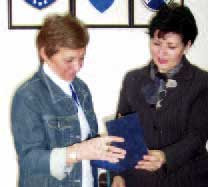 As far as I am aware, people who were involved in this operation kept little contact with each other, all getting back to their normal lives... Anne Schumann, one of the key organizers received recently the medal of the city of Sarajevo by its new mayor, Mrs. Semira Borovac. 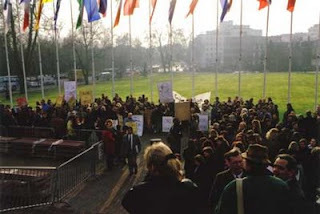 As for myself I returned eventually to my home country, Belgium, ... to help organizing yet another demonstration in front of the EEC in Brussels (is this an obsession?). I had then the opportunity to meet somebody who managed to escape from Sarajevo's thanks to his then-Belgian girlfriend (this is another story that was eventually published in a book). He told me he remembered the parcels quite well, "That was good, we were hungry..." he said. He took the chance to study cinema in Brussels (he was one of the Bosnian army cameramen...). In 2002, he won the Oscar for the Best Foreign Language Film for his film "No Man's Land". His name is Danis Tanovic. Now, I am living in the U.K. and hope this will inspire some.